After deciding to go on a world trip by car the complicated and very individual search fort he right vehicle follows. Our most important criterion was extreme suitability for cross-country work associated with limited weight and length as well as high ground clearance and fording. On the other hand the truck should be big enough for the two of us to live in a couple of years. Besides a personal financial scope the worldwide availability of spare parts and the spread of workshops played a part. 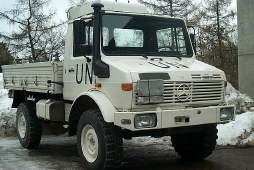 The truck and the engine should be robust for instance regarding soiled diesel or high altitudes in the mountains. Herewith newer models with integrated electronics were ruled out. Of course the technical and general condition of the car were important, and also a reasonable cruising speed and acceptable travel comfort. 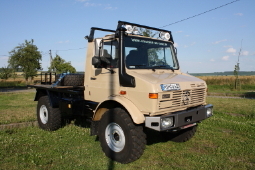 Relatively fast the Mercedes Benz Unimog was chosen. 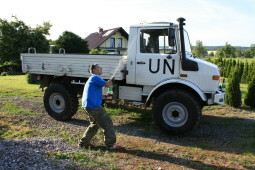 Finally we bought a U1300L from the UN fleet of the German Army, a 1987 model, which probably has been more serviced than driven. The technical upgrade of the vehicle comprised among other things the increase of the engine power and a split gearbox with which 16 instead of eight gears are available. By that we reached higher maximum speed respectively lower fuel consumption. The instal-lation of an additional fuel tank and further canister holders required a new exhaust. 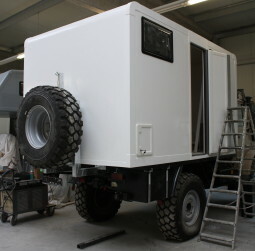 Recently air-cushioned seats with integrated seat-belts and a suspension distance adjusted to the low cabin height of the Unimog were available. Besides we got new shock absorbers and a set of tires suitable for road and off-road as well that can be used with extremely low air pressure. Apart from many little things we have got manufactured a collapsible emergency seat in case a third passenger should ride with us for a short period. 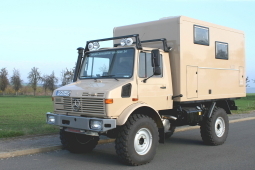 The Unimog was baptized Arminius, a prehistoric Germanic hero whose name was never abused for any active military offensive in the past. On a world trip we’d like to avoid putting our foot in it. An experienced cabin manufacturer made the empty camper cabin from glass fiber reinforced plastic. He built in windows, door, outer flaps as well as bathroom walls, and designed a spare wheel holder. We didn’t want to store the heavy spare wheel on the roof of the driver’s cabin. Insulation and glass fiber walls are strengthened to take robustness and rides to colder realms into account. Back home, the camper cabin also got a lacquering. Continue with the interior works of Arminius.